There is no better way to tell how an economy is doing than by checking out the new car sales, and the good news is that 2013’s sales are the best they have been since 2007. But what are people buying? Are electric vehicles still all the rage? Or are the trucks making a comeback? Well, according to MSN Autos, it seems like trucks are the new kings of the lot. Here are the top vehicles sold through November of 2013. With a dramatic sales increase of 19.5 percent since last year, it’s clear that there is still a need for big trucks, no matter how much gas they require. Through November, there have been 688,810 sold, which makes it the best-selling pickup for 37 years in a row. Why is it so popular? It leads the class in efficient, yet powerful, engines, the hauling and towing capabilities are unparalleled, and the handing can’t be beat. The Silverado’s number two spot on the list is in big part to the newly-designed, refined model released for 2014. It has an updated engine, impressive towing capabilities, and cutting-edge connectivity. That being said, the 2013 version still brought in impressive numbers thanks to the tempting incentives Chevy offered in order to boost sales. Combined, 437,821 Silverado trucks were sold through November, which is 19.1 percent above last year’s figures. Finally, a sedan makes this list. This car is not new to a top-sellers list, with its impressive 378,520 units sold only brining in a 1.3 percent increase above last year. The Camry is consistently purchased because of its classic styling and tried-and-true dependability. However, the Camry better watch out, because many of its competitors are getting redesigned to be sportier and more exciting to drive. With a 10.6 percent increase in sales since last year, the Accord is happy to be in the number two spot for sedans. Over 334,357 people are enjoying their new Accord this year, as they take advantage of the impressive handling, fuel-efficient engine, brilliantly designed use of space, and supreme reliability. 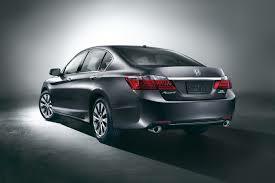 You can’t go wrong with an Accord as a family or commuter car.